Marco Antonio Rubio was born June 16, 1980. 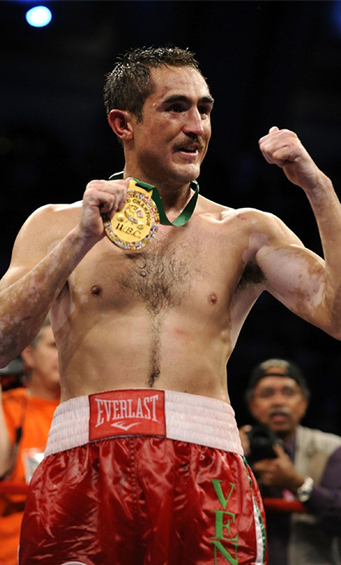 He is a Mexican former professional boxer who competed from 2000 to 2015. He held the WBC interim middleweight title in 2014, and challenged twice for a middleweight world title in 2009 and 2012. On February 21, 2009 Rubio earned the right to fight for the middleweight title by scoring a split decision victory over Enrique Ornelas to secure the World Boxing Council’s # 1 ranking and a shot at the WBC Middleweight title on October 18, 2008 in Atlantic City on the Bernard Hopkins vs. Kelly Pavlik fight card. Rubio fought for the unified WBC, WBO, Ring magazine, and lineal middleweight titles against Kelly Pavlik. Rubio then won six fights in a row since he was stopped in the ninth round by middleweight champion Kelly Pavlik in February 2009. On April 8, 2011 in Bell Centre in Montreal, Quebec, Canada, Rubio was featured in the main event of Friday Night Fights. His opponent was David Lemieux, who came to the fight with an undefeated record. Lemieux was the heavy favorite to win in his hometown against the Mexican veteran. During the first five rounds Lemieux dominated Rubio by landing hard power punches. But Rubio refused to quit and wouldn’t go down. Rubio came back in round six and started to land harder punches that slowed down Lemieux. In the seventh round Rubio knocked down Lemieux. Lemieux got up, but Rubio continued where he left off and threw more punches at him. With only seconds left in round seven, Lemieux’s corner threw in the towel to a stop the fight. Since he won the Lemieux fight, Rubio placed himself into a mandatory position to face the winner of the fight between titlist Sebastian Zbik of Germany and Mexico’s Julio Cesar Chavez Jr., which Chavez won. Rubio made easy work of journeyman Matt Vanda (44-14, 24 KO’s) on December 16, 2011 with a 5th-round TKO win at the Mandalay Bay Resort and Casino in Las Vegas, Nevada.